Bands In Town Gets You Ready To Rock! Are you ready to rock all summer long but don't know when you favorite bands are coming to town? Of course you could go out and search for your favorite bands sites and check each individually but now there may be an easier way. 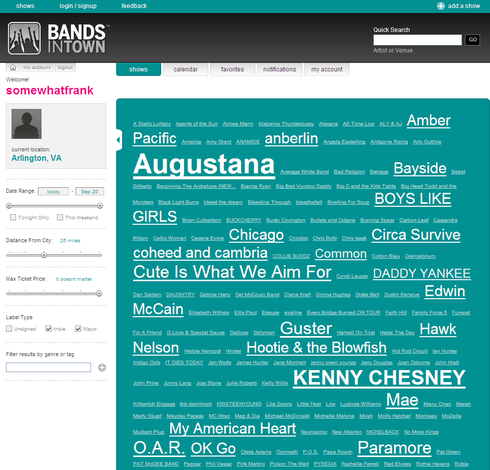 Bands In Town recently launched to help you keep better track of tour dates for your favorite bands. Bands In Town offers the ability to pull in your favorite band information from Last.fm or you can manually save you favorite bands. Upon specifying a geographic location, Bands In Town serves up a huge tag cloud of bands that you might enjoy. Check out the screen-shot below. Bands In Town also informs you when your favorite band is in coming back into town which saves you from having to keep track on your own. Rock on, you shouldn't miss a show again!